According to "The Dellinger Family In Georgia" by S.E. 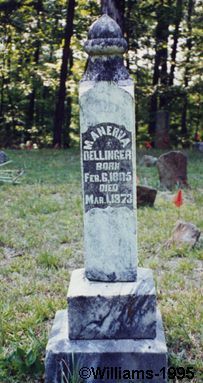 Dellinger, MOSES and MINERVA DELLINGER are "buried in Macedonia Churchyard on the North shore of Lake Allatoona along with all their children except ROBERT and HARRIET." 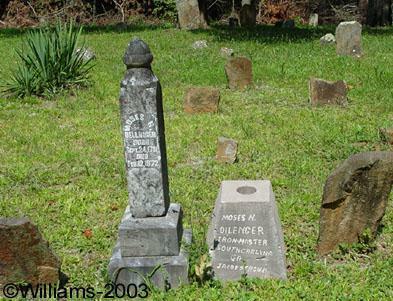 The object seen next to the tombstone is a tribute to Moses work as an iron master. Some Dellinger researchers have placed Moses N. Dellinger as being the child of Phillip Dellinger 1766-1820 and his wife Catharine Stroup. This is incorrect. Phillip and Catharine did indeed have a son named Moses Dellinger, but that person is not the same as Moses Nathaniel Dellinger. Phillip, Catharine and family had moved prior to 1820 to Wayne County Missouri, and never returned to North Carolina. Phillip died there 22 July 1820. Phillip Dellinger’s son Moses married Hannah Crites, not Jane Dellinger. Copeland as his second wife. She was the daughter of Reuben Copeland. Sometime shortly after 1840, Moses N. Dellinger and his family moved to Cass County Georgia, where it appears he entered into a business partnership with the “Iron-master” Jacob Stroup. Moses N. Dellinger, who The Dellinger Family in Georgia says was indentured to Jacob and Moses Stroup, was also an ironworker and a millwright.The original Stroup/Dellinger ironworks mill and furnace was located at the confluence of Stamp Creek and the Etowah River. It was purchased from them by Mark Cooper in either 1842 or 1844. The furnace, site of a Civil War battle, still stands, somewhat restored, although the town of Etowah that grew up adjacent to it, was burned during that Civil War battle (part of the Chattanooga-to-Atlanta campaign of late spring 1864). The site of the town is now covered by Allatoona Lake. Moses N. Dellinger’s “home place” was on Stamp Creek, about 8 miles east of Cartersville GA, but it too, is now covered by Lake Allatoona. Regardless of his humble beginnings, Moses Nathaniel Dellinger lived to a ripe old age, dying on 2 February 1872. He fathered 10 more children by Manerva Copeland, and seemingly left a legacy of civic service as well. There is still a very large park at Cartersville GA named in his honor.